In some countries, especially those with Hindu and Buddhist religions, having an elephant in a temple supposedly bring fortune and good luck. They are mostly used to bless the locals who feed them or take pictures with them in exchange for a donation. Although not working directly in the tourism industry, tourists can often see them in countries such as Sri Lanka and India. The lives of elephants in temples are full of stress, boredom, loneliness, physical pain and psychological suffering. They are chained in one spot for long periods of time (even permanently) and often on hard surfaces (which are harmful for their delicate feet). To restrain animals, they are often chained by their legs, sometimes by a front and a back one which prevents them from even turning around. This severe limitation of movement, causes stress to the elephants, frustrates and even maddens them. In these cases, one can often observe stereotypic behaviors such as constant rocking their heads or balancing their bodies to pulling on the chains. These are unhealthy behaviors and not a dance as their owners will often claim. Over time, the chains can cause cuts, wounds or serious life-threatening infections. 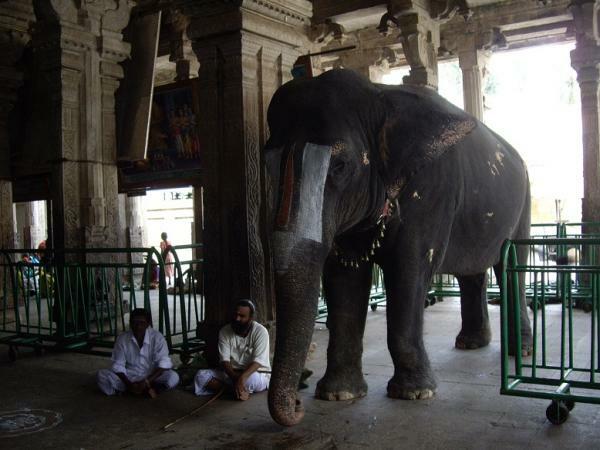 (Elemotion.org Photo: A young elephant at a temple held by two chains, front and back, and that must sleep in its own excrement and urine). The temples are not equipped with adequate facilities for the care of an elephant which can meet the animals’ basic needs. For example, a wild elephant spends 18 hours a day looking for food and can drink up to 200 liters of water. During the hottest hours of the day, a wild elephant will seek shade to keep cool and spread dirt on its skin to protect it from the hot sun. They spend much time in the water to cool their bodies, soften their skin and take mud baths. In a temple, the lack of shade and access to water can cause them skin irritation, discomfort and sunburn. Elephants are highly social animals, females and young live together in herds and calves spend time playing. The elephants in temples are isolated and where there is more than one, they are deprived of contact with others. These same elephants are made to participate in religious processions, celebrations that can last for several days and during which the animals are deprived of rest. Surrounded by lights, people and noise, these processions can be very stressful for the animals. During the festival season, elephants move from one procession to another and at the end of the season, many of the elephants are very weak, malnourished, dehydrated, aggressive, and sick. To control these huge animals and make them submissive, they are usually deprived of food and water, are isolated from other elephants, chained, sleep deprived and stabbed with sticks that have sharp nails attached to them on sensitive areas such as their ears and eyes. The pajaan is "training" or "domestication" method whose purpose is to "break the spirit" of the animals, to make them submissive and render them totally incapable of ever disobeying the orders of humans. This is achieved by separating baby elephants from their mothers (which alone is extremely traumatic), then placing them in small cages where they are tied so they can not move. 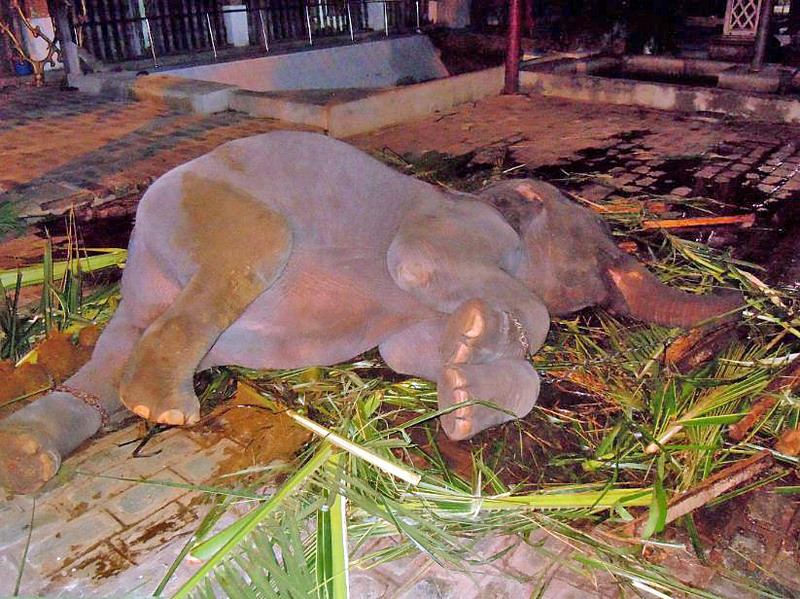 The elephant is then beaten and stabbed repeatedly with sticks that have sharp nails attached to them. The beating goes on for several days. The more the elephant struggles, the more severely it is beaten. As you know, elephants never forget so after the pajaan these giant creatures will forever be fearful of humans and always do what they’re told. In just 12 years in the Indian state of Kerala, some 1,000 elephants have died during their "training". There is irrefutable graphical evidence of this process, as this video from National Geographic (Training Crush) and the photo report of the Magazine. Metal hooks are generally used to dominate the elephants, and they are often used in an abusive and aggressive way. We often see injuries to the head of animals and behind his ears, showing that they have been mistreated.